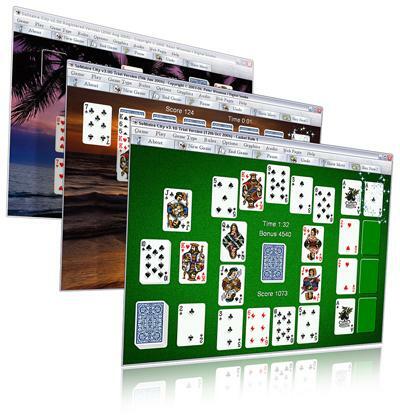 Solitaire CityTM is a collection of solitaire card games of the highest quality, played against the clock for points. The faster you complete a solitaire game, the higher your score. Solitaire City automatically downloads the best scores of solitaire players from all around the world for real-time online tournaments. Try to beat the best solitaire players in the world or just compete against yourself or friends, trying to shave a few seconds off your best time. Solitaire City is incredibly addictive! You can download a Trial Version of Solitaire City that you can play test for Free ! Solitaire Setty, the free cardset design tool is now available in a brand new version that supports the new Jumbo and King Size cardsets. Create your own cardsets for Solitaire City. 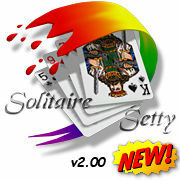 Download your free copy of Solitaire Setty here. Unique, timed scoring system with online leaderboards and local hi-score tables. Over 300 Daily, Weekly and All Time Greats online leaderboards, automatically downloaded to your computer. Unique hands-on training teaches you the rules while you play. Choose from many HUGE, high quality card sets. Customize the card sets, backgrounds and sound effects. A life time of Free updates.